I have recently rediscovered Ghee and all its lovely properties and wanted to help you discover or rediscover it for yourself. 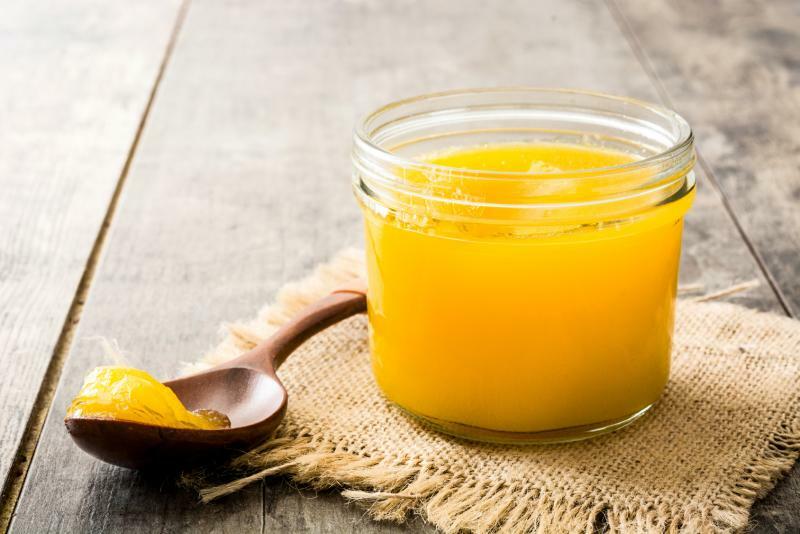 Ghee has been described as being agreeable to our body tissue as it is similar in nature as well as being a great source of butyric acid, more about that later. When we consider that since low thyroid function often goes hand in hand with high cholesterol this is a great food to add to our diet as we go about balancing our thyroid function. Has a high burn rate so can withstand cooking and frying and not break down into free radicals, and it makes food very tasty! Previously I mentioned that Ghee contained butyric acid, butyric acid is found in animal fat, plant oils, bovine milk, butter, parmesan cheese and breast milk. It is a product of fermentation. This short chain fatty acid feeds the bowel and supports the integrity of the mucous membranes, therefore it plays an important role in the health of our gut barrier and may help with diseases that are linked to leaky gut, for example, fatty liver, and autoimmune diseases. This wonderful food helps grow bacteria like bifidobacterium, may help regulate bowel movements and increase insulin sensitivity. Ghee may also help reduce hunger levels and boost our immunity and increase metabolism. Studies have shown that adding 10% of ghee into our diets has wonderful benefits to our overall health and well being. Why not give it a try? Place a teaspoon or so of ghee in a pan over a low to moderate heat. Add half a teaspoon of freshly ground spices or garam masala fry for a second, add the oats and stir for 30 seconds. Add a good pinch of salt, water and boil for 10 minutes. Let settle for 3 minutes or so with the lid on a full fibre grain is thirsty. Serve with a dollop of yoghurt and a slice of butter or ghee. Sprinkle of garam masala and pepper to taste. Place ghee in a pan over a low to moderate heat. Add a teaspoon of freshly ground spices. Add the fresh oats and stir fry the spicy oats for a few minutes. Add the mik and water, chopped dates, chopped fruit. Bring to the boil and then simmer for 10-20 minutes. Take with fresh milk, add a little honey on top if you really have to!